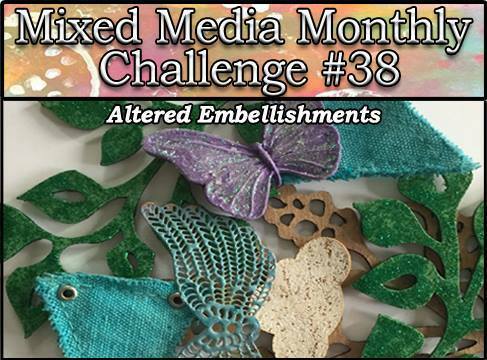 Mixed Media Monthly Challenge #38 Altered Embellishments! Another month - another awesome challenge!! 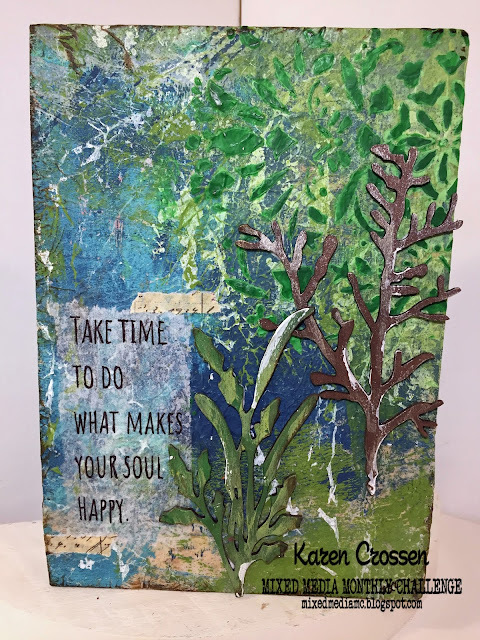 It is so much fun to play with embellishments - I just loved this month's challenge! Our design team had the opportunity to use Um Wow Chipboard Pieces - they are fantastic! I loved the shapes and the their ability to put up with whatever I threw on them! So come and play with us at The Mixed Media Monthly Challenge - you will love the challenge and it is a great way to get your hands in some mixed media art every month! "UmWowStudio is an innovative on trend chipboard, flair & stencil manufacturer located in Las Vegas, NV. Partnering with other companies & now amazing designers our line is always expanding. Our chipboard is extra thick with a beautiful rich kraft finish ready for any medium." And remember that one lucky random winner will win an awesome $30 Gift Certificate with free shipping to UmWow Studio!! I started with a wood block. I found in my stash a piece of deli paper that I had painted on using a brayer. It was just one of those pieces that you keep around because you know that you will use it someday. It became a background for a tree and nature scene, so the deli paper worked great! I sprayed, painted and put some more paint on the Um Wow Chipboard! 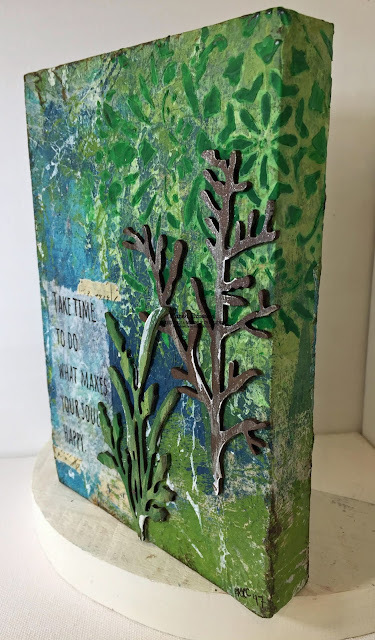 The pieces really could be used in a hundred different ways, but here one is a tree and the other is a plant in the foreground. I just love getting these chipboard pieces ready so much so, that I didn't take one picture of the chipboard process! I used a stencil with green paint and modeling paste to create the texture of the tree on the deli paper background. There were a few mess-ups along the way as a couple of 'tree leaves' that I didn't like. But thankfully the deli paper background made it really easy to wipe off the unwanted designs and try again. I glued the deli paper down to the wooden block with matte medium and wrapped it around the block. The tree branches went around the edge! Loved that! I used some craft glue to stick the chipboard in place. Then using the computer and printer I created a saying on tissue paper and glued it down to the paper with matte medium. The words were actually very hard to see with the background showing through the paper so I had to use a pen to go over the font. It actually turned out okay and looks more handwritten than printed! Come Play with us!! Try it once and you will be hooked!